When you have a child who is at that stage where they are ready to read chapter books, this series might be a good one to start with. It is still easy to read, it doesn’t have too many words per page, it has colored pictures, but most importantly….it has CHAPTERS!!! They always feel so accomplished when they can say they’ve read a book with chapters. It’s also a good pick because there are a lot of Henry and Mudge books and if you can get those young readers started on a series they will read and read and read until they’ve read every book in the series. If you are wondering who Henry and Mudge are, they are a boy and his big loving dog who are also best of friends. 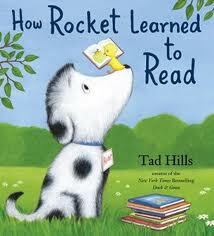 A little yellow bird that lives near Rocket has opened up a school and is determined to teach Rocket how to read. Rocket learns the alphabet and how to put letters together to make words. School has to close for the winter while bird is away, but Rocket practices over the winter and is very ready to learn when bird returns in the spring. If you have a child who is at that age where they really, really want to learn how to read or they are just beginning to read, they will absolutely love this book. It is such a cute story…I love the relationship between the bird and Rocket and I also love how, on the first day of school, she reads Rocket a book about a dog who is digging for a bone, but leaves off right before the dog in the story finds it. Rocket returns the next day very eager to find out what happens and that is when Rocket learns the magic of books. 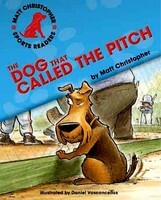 If you have a child who loves sports then you need to check out Matt Christopher. He has written fiction books on every sport from baseball to skateboarding to ice hockey to soccer. Since this blog is dedicated to younger readers, it is important to note that he has books that are geared more for the 6-8 year old group and then others that are geared more for the 9-12 year old group. The books that are for the younger set are easier to read and have illustrations every few pages. Also, the books for the older kids do cover some topics that may not be appropriate for the younger set, nothing horrible, but maybe things they just aren’t dealing with socially at school yet…things like that. This is a great book to talk about similes and metaphors with kids while also discussing how family members are all different, but very important pieces of a family. This is a cute and fun tale of a clever little girl outwitting a bunch of trolls as she tries to hike over the mountain with her dog. 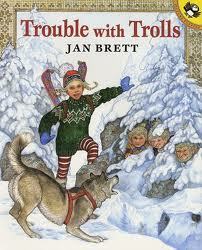 This is one of Jan Brett’s books that you can read again and again and again and each time you read it your child will find something new in the illustrations…so much fun!!!! Carl and his charge have a fun-filled adventure in the snow while the parents are at a party and the babysitter is watching TV. Carl books are great picks for little ones as they often come in board book form and they usually don’t have a lot of words. They are great books to look at and talk about the pictures and then there aren’t any words, the story can be a little different every time you “read” it. Sid is walking to school one day when a funny feeling comes over him. He is so overcome by the feeling that his paws lift off the ground and he starts to fly. He is very excited when he gets to school and he tells his friends that he flew to school. No one believes him, not even his teacher, and Sid ends up having a very long day. When he gets home his dad notices that Sid is not being himself. When Sid explains that he is sad because dogs don’t fly, his dad has a little secret for him…it turns out Sid’s dad does and so does Sid. 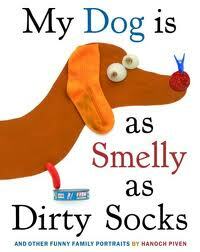 We love our Mark Teague books around here and this one is no exception. Ike LaRue (who happens to be a dog) ends up running for mayor when it seems that the other candidate’s campaign starts to sound a little “anti-canine”. Did I mention that Ike and his friends have been stealing meat from the butcher and tipping over hot dog carts? No matter. What’s important is that Ike and his friends are not restricted by leash laws and curfews. In true Ike fashion, Ike ends up saving the day and a resolution to the dog problem isn’t far behind. You will definitely “like Ike”. Oscar is a wiener dog and all of the other dogs are always making fun of him. So it doesn’t help that one Halloween his mom makes him a bun costume so he looks like a hot dog with mustard. All of the other dogs are vampires and mummies and witches and poor Oscar has to trick-or-treat in his hot dog costume that makes him walk so slowly that by the time he gets to each house, all of the candy is gone. It turns out to be the best Halloween ever though when a horrible monster (turns out to be a bunch ornery cats in disguise) chases the other dogs into a lake and Oscar is there to not only expose the cats, but to also save his friends. It turns out that his hot dog costume also makes a wonderful life raft. 🙂 My youngest son has read just about every single Halloween picture book that exists and this is one of his favorites. 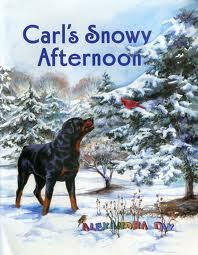 There are several Carl books and in all of them Carl, the dog, is left with the baby to babysit. These books have very few words and take you on an “adventure” with Carl and the baby while the parents are out. 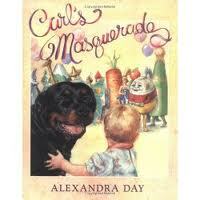 My boys loved these books when they were tots. The illustrations are so full of detail that instead of reading the books you end up talking about the books and pointing out all of the interesting details in the pictures. These are great books for snuggling and talking when you have a little extra time to spend with your little one.